I wish I could say that I made this dish, but the credit goes to my dear husband, who prepared petrale sole filets on our griddle, something we’ve never attempted before. Our default method for this fish is the classic “sole meuniere“, which is ready in minutes in a luscious butter sauce, with lemon, parsley and capers. Healthwise, it’s a bit of a wash: the fish is so light and healthy, but it’s swimming in butter… Nevertheless, the taste is awesome (worth every molecule of saturated fat it contains). Seriously. this griddled alternative was absolutely delicious, undoubtedly also from the high quality of the fish. It’s so nice to have a fish monger nearby! Rinse the fish briefly, dry with paper towels. Sprinkle a little lemon juice all over the filets and season with salt and pepper. Dredge each filet in salted/peppered flour or very carefully shake the filets in a paper bag with seasoned flour. Coat the surface of the griddle with a tablespoon of oil, set it at maximum temperature (ours goes to 400F), and cook each filet about 5 min per side, until both sides are golden brown and the fish is cooked through. In the last couple of minutes squeeze some lemon and drop a small pad of butter among the filets, if you like. Serve with lemon wedges. 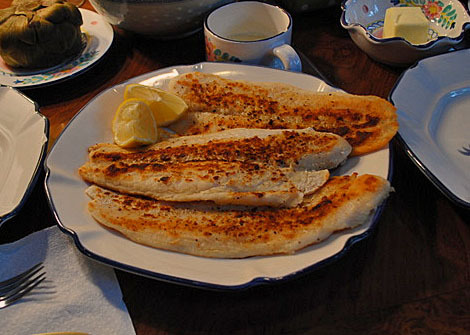 Comments: When your are fortunate enough to find fresh petrale sole, the less you mess with it, the better it will be. It’s such a terrific, delicate fish, don’t suffocate it with powerful flavors. We were amazed by how well the griddle fried it. In a sautee pan, even with high heat, the coating may become soggy. This doesn’t pose a problem in a classic sole meuniere, because the pan sauce coats the fish and distracts from the texture. Griddle-frying, on the other hand, resulted in crisp, dry filets that weren’t greasy, and the lemon juice sealed the meal. Amazing that we had to travel a thousand miles to a downsized kitchen to discover this way to cook a fish filet! o boy o boy how i would love to be in california feasting on fresh fish right now…. i don’t know much about sea bass and where you can find it (hopefully where you are), but if you ever see it there and decide to cook it, let me know how it turns out! we had this sea bass dish in a kansas city restaurant, and LOVED it. Jenny, sea bass is my favorite fish in the world! They have it here, but it’s quite expensive (over 20 bucks per pound). At some point they were asking people not to order or cook it because sea bass was being over-fished, I don’t know how the situation stands right now. I’ll check it out. Sea bass is amazing, though! Very ingenious, and it looks delicious. This is one of my favorite types of fish. Ingenious indeed – of course I had no choice but marrying him! “Sea Bass” is actually lots of different fish here. Ask your fishmonger-many of the fish called that out here are on the okay to buy list.